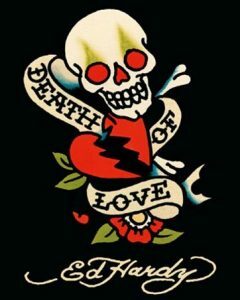 Besides the influence of Sailor Jerry, Ed Hardy also was schooled by another important figure in American tattooing – Phil Sparrow. Sequentially, Ed Hardy’s contact with Collins resulted in strong interest of the former in oriental tattoo and this is why in 1969 after moving to San Diego he opens a studio which specializes in Japanese tattoos only (DeMello 2007). In the following years, also with help of Sailor Jerry Hardy became acquainted with several Japanese tattoo artists and consequently spent a year of 1975 working in Japan. After his return, Don Ed Hardy opened in San Francisco first in the US tattoo parlor that accepted clients only by appointment and provided only custom one-off tattoo services. Indeed this fact can be tied to Sailor Jerry’s enmity towards the copying-attitude of tattooers that influenced Hardy. The studio, called Realistic Tattoo became a level each tattoo artist within USA was trying to reach, it became a prototype for all modern tattoo parlors. Another Hardy’s accomplishment that heavily influenced the world of tattoo was his magazine TattooTime, that became Hardy’s major source of fashion navigating, bringing to general consideration such styles as tribal or chicano that before appearance on the pages of TattooTime were nearly stigmatized embodiments of distaste and deviant social group belonging. Even though TattooTime was not first tattoo magazines it pioneered in target audience determination, it was aimed on middle class and apart from information published for tattoo community insiders it contained articles of tattoo-educating purpose (DeMello 2007). This allowed to inform and interest new customers from previously detached parts of the population, and promotion of tattoo styles as Japanese or tribal served a counterweight to oldschool sailor- style tattoos that were a mainstream across the US.